Built in 1910, 725 Penn Avenue NE commands the corner of Penn Avenue and 4th Street in Midtown. It’s a diagonal block from some favorites eats like Papi’s Cuban and Bon Ton, Mary Mac’s Tea Room and more. An arbored gate opens into the yard anchored by a full-width front porch. True southern style indeed. The single-family, 6 bedroom, 5.5 bath home is 5,500 sqft. Large spaces and a flowing floorplan offer buyers the modern features they desire. The home has tons of large windows that flood the house with light and blur the line between indoor and outdoor. Original architectural details like beamed ceilings, top-nailed hardwood floors with inlaid designs and crown moulding are found throughout the house. A large eat-in kitchen with professional appliances sits just off the sun room (above) and opens to a full-width back porch. It overlooks a spectacular backyard that makes it easy to entertain and maintain. The detached garage has been converted into a separate living space, usable for an in-law suite, office/studio or rental unit. Past the powder room and up the the stairs you’ll find a large master suite unsurprisingly filled with abundant light. The master bath has a double vanity, large tub, water closet and glassed enclosed shower surrounded by windows on two sides. Last but not least, the home has a basement with wetbar and wine fridge with enough rooms for just about anything. 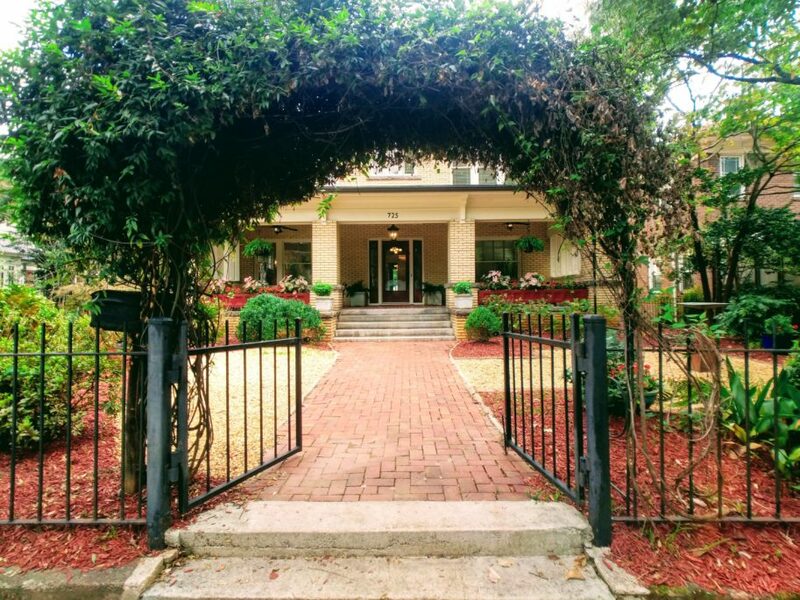 The home is within walking distance of the Fox Theater, Piedmont Park, the Beltline, North Avenue MARTA station and all the shopping and dining Midtown has to offer. It’s graded an 88 Walk Score, 64 Transit Score and a 75 Bike Score and school cluster is Springdale Park Elementary, Inman Middle School and Grady High School. Contact us today to see this home.